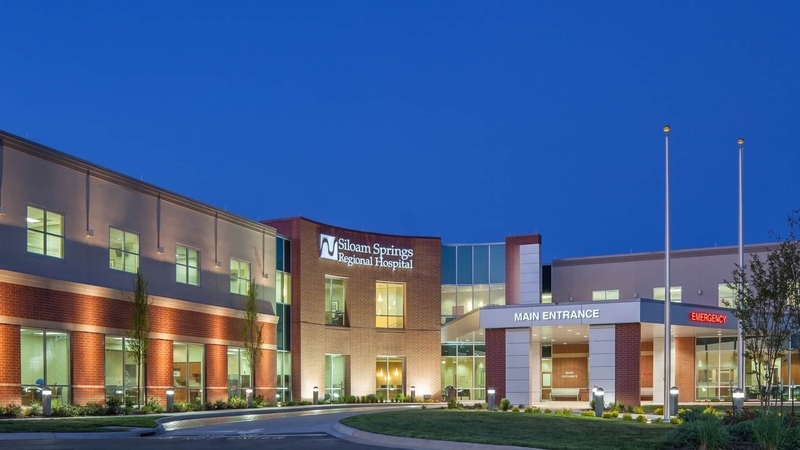 Located amongst the rural farmlands of Arkansas the new 42-bed Siloam Springs Regional Hospital serves a small community with a modest population. From the beginning, this 92,000-square-foot project relied on creative “Lean Solution” design concepts to eliminate inefficiencies and achieve a highly sustainable medical facility, both financially and environmentally. With abundant support from the City of Siloam Springs, including a land grant, the design team worked to ensure optimal operational efficiencies, allowing the medical professionals to provide the highest level of healthcare, within aggressive square footage and budget constraints, and a demanding twelve-month construction schedule. A full range of healthcare services including an outpatient surgery department, emergency care, health education services, medical surgical/ICU care, obstetrics, outpatient diagnostic services, cardiac rehabilitation services and surgical services. Explicit strategies for hospital expansion on both floors as well as thoughtful site planning to easily accommodate future expansion of the hospital complex with the addition of medical office buildings and increased parking. A detention pond on the property which controls storm water run-off and reduces the degradation of neighboring streams and creeks. A walking trail around the pond provides an outdoor destination for patients, staff and visitors.